Food on a food blog? No way! I know I’ve been a miserable food blogger lately, and I’m certainly grateful for your continued support! Believe it or not I actually cooked something last night! I really wanted a good, yummy dessert. Nate remembered that we have about 500 gallons worth of different kinds of hot chocolate in the pantry…which sounded good, but I still wanted something to nibble on as well. Shortbread sounded like it would hit the spot – a perfect companion for the hot chocolate. So I got mixing and Nate got melting. It ended up being just what I needed. I found the shortbread recipe on AllRecipes. It came out great, and it was EASY. Just what I needed in my contracting state. Interesting b/c it calls for brown sugar, which surprised me, but the reviewers said you HAD to do brown sugar, so I trusted them – it worked great. Definitely a good holiday giveaway cookie. You can see I didn’t spend much time trying to make them look good, but that’s because I knew they wouldn’t last long out in the real world anyway. We use this recipe all the time and if I may make a yummy suggestion–mix up a bowl of chocolate pudding for dipping! This is definitely on my “to try” list. Thanks for the idea, Jane. And best wishes to you on a safe, healthy, and happy delivery! 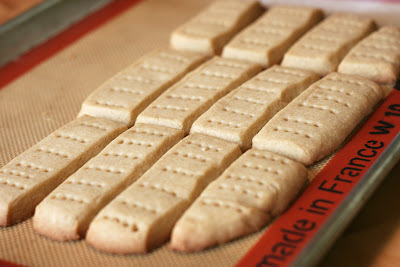 my friend adrianne sent me this link to a coconut shortbread recipe…sounds so good! laurel – shortbread and chocolate, yum! I could go for some of these right now! !